"You see them," a former border resident said of the Border Patrol, "and they have a different meaning now." BROWNSVILLE, Texas — Damaris Constantino, born on the southern border, is feeling that she is more likely these days to be stopped by authorities and made to prove she belongs in the United States. In contrast, Martín Sepulveda and Dwight Yoder are glad to see a strong Border Patrol presence in their city. They all think children should not be separated from their families. The seam between Texas and Mexico has created a fabric of American life filled with a citizenry who converse in a mix of Spanish and English and who may quench their thirst with a "michelada" while satiating their hunger with a sirloin steak. Their lives, family and work extend across the international line. But the Trump administration’s recent policy that separated children from their parents and the ramped-up prosecutions of people entering the country illegally, as well as the push to build a border wall, have some feeling that the symbiotic life they’ve lived here is threatened. Constantino, 34, was one of a few hundred people who took part in a protest last week outside the federal courthouse in Brownsville, which is in Texas' southernmost tip and just across the Rio Grande from Matamoros, Mexico. Born in Los Fresnos, Texas, about 17 miles north, Constantino's family went back to Mexico when she was 4 and then returned later. Like others who live in Texas’ Rio Grande Valley, Constantino is accustomed to the presence of Border Patrol and Immigration and Customs Enforcement (ICE) as part of the community and part of the local economy. Los Fresnos is where the Port Isabel Detention Center is, which is operated by ICE and where many of the parents who were separated from their children and prosecuted on charges of crossing the border illegally are being held. Constantino told NBC News she feels immigration authorities' presence in the Rio Grande Valley has become more aggressive. “We are all brown and we can be their targets. Now we actually have to prove who we are and if we have papers or not, and in the past, it wasn't like that," said Constantino, who held a sign at the protest that read "Love thy Immigrant Neighbor." “Now it feels like they are taking any opportunity to arrest anyone," she said. "It’s like now, we don’t feel comfortable about them. Their strategy changed." Isis Avalos, 32, said she didn’t realize how unique the Rio Grande Valley border area is until she left for Los Angeles. Originally from Mexico, she lived undocumented in the U.S. She said she grew up seeing young people cross the border to attend school or to go to Mexico to get cheaper medical care. “Our border culture is always going back and forth,” said Avalos. “A lot of us have family just on the other side of the river, so we visit our families every weekend or we go out to eat." "It’s a symbiotic relationship we’ve had with each other,” she said. Thousands of vehicles and pedestrians flow back and forth across the border, legally engaging in the commerce that makes Mexico the United States' third-largest trading partner and the United States, Mexico's largest. Many residents know that amid that flow are goods and people who cross illicitly, some to do harm but many hoping to escape violence, poverty and oppression, as some of these residents' know their ancestors may have done. Avalos lamented seeing, on a return trip from Matamoros to Brownsville, that Customs and Border Protection (CBP) officers were stationed on the bridge just inside the international line that marks where the United States ends and Mexico begins. 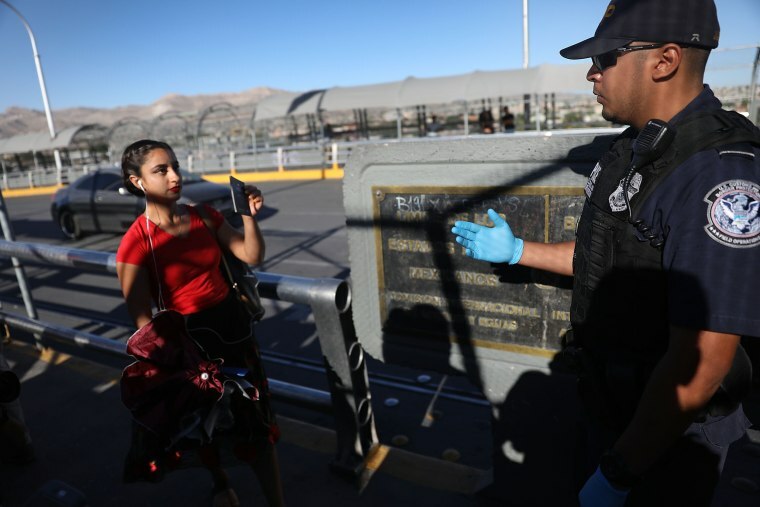 CBP officers, usually positioned at the start of the bridge on the U.S. side, started stationing themselves on the line after the Trump administration implemented its zero-tolerance policy. By American and international law, a person must be allowed to make an asylum claim after stepping on U.S. soil. There have been complaints that inspectors have been stopping people who want to claim asylum and telling them the processing center is at capacity and they should return later. “Just yesterday I looked over to the Rio Grande/Rio Bravo and there were Border Patrol boats running up and down the river," said Avalos. "I felt the presence of this constant looking over and it didn’t use to be that way." But she also said she knew some of the officers on the bridge and at the port of entry. They had been high school classmates and childhood friends; she greeted some with hugs and hellos and they caught up with each other and discussed where their lives had taken them. Some of her former classmates work for Southwest Key, which runs a converted Walmart that is now housing unaccompanied children and those separated from their parents. "Being from the border, you have to learn that sometimes it comes down to people need jobs, people need to survive," Avalos said. "Crossing the bridge and realizing I know these people that are these Customs agents now — [it] brought things back to the human to human level." Kevin García, 35, was born and raised just outside Brownsville and is now living in Austin. Border Patrol’s vehicles were always a presence when he was growing up. He recalls not thinking much about them. The recent family separations, though, have cast a new light on the immigration and border authorities’ presence, said García. “You see them," he said, "and they have a different meaning now." There is another aspect of the border that its residents know as part of its existence. The movement of contraband across the two countries is as old as the border itself, whether it was liquor during Prohibition or the illicit drugs that are bound for users in the U.S. interior. Sometimes the contraband is people. Along with the hundreds of thousands apprehended each year trying to enter the U.S., there are thousands of Americans — mainly retirees — who live illegally in Mexico. There are 16,605 Border Patrol agents on the nearly 2,000-mile Texas-Mexico border, guarding areas that are between the U.S. ports of entry, which are the legal entry points for immigrants. Texas' Rio Grande Valley sector has the most agents with 3,130. In addition to stopping illegal immigration, they seize hundreds of thousands of pounds of illegal drugs each year. But illegal immigration has hit historical lows. Despite spikes in recent months, the number of apprehensions from October to May of 2018 (the first eight months of the fiscal year), 256,857, is less than what it was during the same period the previous year, 310,531. That's also substantially lower than in 2016, when the number was 415,816. Apprehensions vary by sector and the Rio Grande Valley sector, with six stations on the border, has actually seen a drop in arrests of families and unaccompanied children crossing the border illegally during the period from October to May. The Trump zero-tolerance policy of prosecuting all people charged with entering the U.S. illegally and separating families from children began in earnest in the Rio Grande Valley in the second week of May. In an interview for NBC Dateline's report "The Dividing Line" that aired Monday, Rio Grande Valley Border Patrol Sector Chief Manuel Padilla said there is an adversarial relationship between Border Patrol and humanitarian groups, largely by virtue of the focus of their missions. "But it doesn't have to be adversarial. I have many a good friends that came together to develop initiatives in order to save lives. And saving lives by working together — educating people not to place their lives in the hands of smugglers — identifying smugglers ... and just collectively working to save lives where the two missions or the purposes meet," Padilla said. Often not seen or talked about is that Border Patrol agents often rescue people from the desert or river, he said. "Here, in the Valley, we are one of the biggest law enforcement agencies, said Padilla. "And just where we have the presence ... we act as first responders." In the Laredo sector, which is not part of the Rio Grande Valley but is on the border, agents average arrests of 100 to 120 people a day who are trying to cross the Rio Grande into the U.S., according to Gabe Acosta, CBP assistant chief patrol agent who spoke with NBC News. Arrests can only be made on U.S. soil. The river is international territory, Acosta said. During a patrol last month with an NBC News crew in tow, agents encountered two separate, small groups of immigrants, including one with a woman who said she was six months pregnant. Agents were taking her for medical care. "Scenarios like this group of illegal aliens, drugs coming across the borders, it's an everyday occurrence," said Acosta. "It happens on a consistent basis and it's not just a matter of where, it's when." Sepulveda and Yoder, who had stopped at a McAllen gas station, say there's need for a strong Border Patrol presence, perhaps more of one, and they feel safe in McAllen when they see it. Yoder said he likes the helicopters and wishes there was more of a border enforcement presence. "They are doing what they need to do," Sepulveda said of the Border Patrol. "Not a day goes by we don't see a story about a stash house (where immigrants are held until smugglers are paid) being found," he said. But he and Yoder drew the line at parents being separated from children. "I don't like that," Yoder said. Residents maybe have grown “callous” about the growing immigration enforcement presence in the Rio Grande Valley because border and immigration officers are a regular part of life here, said Michael Benavides, an education administrator who attended the protest in a park in front of the federal courthouse. Benavides said the family separations may have woken people up and “exposed” the community to the effects of immigration policies that go too far. Benavides, originally from San Benito, Texas — the birthplace of the bilingual country, rock 'n roll and Tejano musician Freddy Fender — said he was so disturbed by the Trump administration’s forced family separations, he felt compelled to participate in the protest. He and his friend Sergio Cordova, 51, born and raised in Brownsville, held a homemade "clothesline" on which they had hung seven baby "onesies." The onesies were stenciled with the black letters R-E-U-N-I-T-E.
Cordova, also an educator, said he became unsettled when Trump instituted his zero-tolerance policy that has led to 70 or more people a day appearing before a federal judge at once on misdemeanor charges of illegally crossing the border, waiving their rights to a trial and declaring themselves guilty. His indignation rose as he saw reports that CBP officers were stopping people from seeking asylum on international bridges so they could not get to the port of entry to make the claim. The child separations, however, were the heartbreaker, the "straw that broke the camel's back," he said. "I accept we do need a strong border, but we also need to accept people with humanity," he said. "I understand we have an immigration issue, but people should always come first."